Sometimes gardeners purposely build a raised bed vegetable garden and sometimes raised beds are just wicked little plots that happen! Maybe you've been given some garden boxes, maybe you have recycled wood, rocks or other edging to use, or possibly you want to define your garden areas. Now you decide is the time for building a raised bed vegetable garden. All the information you need to know can be read here Raised Vegetable Garden. Whereas THIS page gives you a mix of photos and ideas that other gardeners have used... raising your hopes that you can build your own raised garden too! Roll up a few old tyres (or tires) into your yard and either make an enclosure with them, and/or fill the tyres with soil and plant away. Some people even paint their raised garden tires... eek, pink tires, no don't! For smaller gardens and those that are neat'n tidy, here are some ideas that might cut the mustard for you... speaking of which, here's a raised garden bath with mustard cress growing in it. 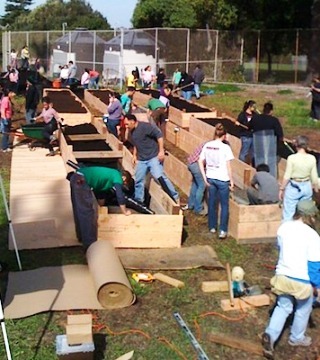 Helpers and pupils of Richmond High School construct 6 wooden planter beds. Each wooden bed spans 32 feet in length, 4 feet across, and nearly 2 feet deep! But if you only have a small area, or it's on concrete or stony ground, then some nice neat garden boxes are an excellent way to enclose your garden. 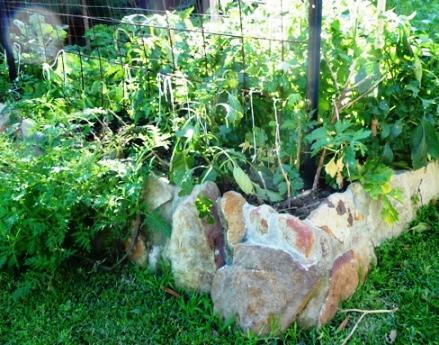 Here's a good sturdy home vegetable garden that does the trick nicely. Another way to edge a slightly raised bed. These stones keep in the soil and define the garden. 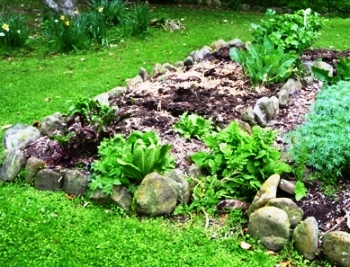 And these even larger stones have been cemented in place to make an attractive raised garden. 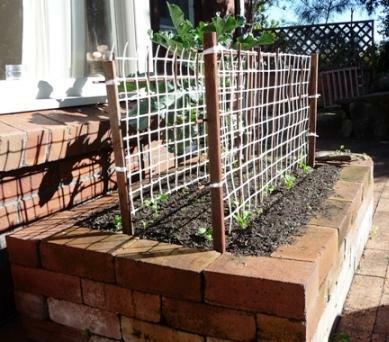 Super tidy and built to last raised brick garden. 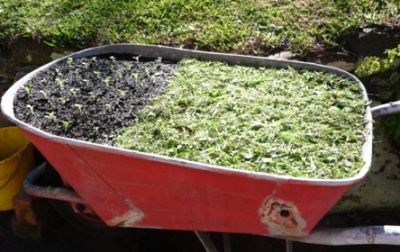 An old wheelbarrow past its usefulness as a workhorse, is now used as a seed tray. Lawn clippings are being put on as mulch. What's YOUR raised bed vegetable garden like? 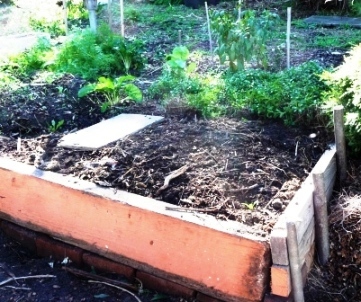 Do you have a great photo or ideas, methods, materials on building a raised bed? Share it! We can't promise to publish all contributions, but would love to see good examples that would inspire and encourage other gardeners. Add your photo(s)or graphics here Click the button and find the first one on your computer. Select it and click on the button to choose it. We scavanged some wood chips to keep birds and weeds at bay. Our spinach plants are doing just nicely!